Doxorubicin (DOX), a broad-spectrum anticancer drug, has considerable side effects in body, especially in heart and liver. DOX can promote the generation of ROS and malondialdehyde (MDA),  and can inhibit the activities of SOD, CAT, GSH-Px, and other anti-oxidative enzymes, resulting in OS injury. Cordyceps sinensis (CS), a widely used traditional Chinese medicine, is a composite consisting of CS (Berk.) Sacc. Parasitized on the larva of some species of insects of family Hypocreaceae and the dead caterpillar. CS has long been used to improve quality of life and promote longevity. It is now commonly used as a health product,  with a wide range of pharmacological effects, such as immune regulation, antitumor, anti-senescence, and hypoglycemic and hypolipidemic actions. , Owing to the strict natural conditions, only an extremely limited amount of natural CS is produced. Fermented CS (Cs-C-Q80), as a substitute for natural CS, is widely used in the field of supplementary medical treatment and health products. Fermented CS is produced by purifying and artificially fermenting the fungus isolated from fresh Qinghai CS. Its pharmacological effects are similar to natural CS. , Some studies demonstrate its antioxidant action. , However, most studies mainly focus on in vitro experiments, and no research has assessed the effects of CS on inhibiting OS injury of different organs, especially the liver and heart. In the present study, we selected two different formulations and sources of fermented CS to explore their effects on OS treated with DOX and to compare their anti-OS effects in heart and liver. Cordyceps sinensis mycelia are isolated from natural CS to produce fermented CS (Cs-C-Q80) by artificial fermentation. Its chemical components are similar to natural CS and contain amino acids and mannitol, the products meet the standard of the Pharmacopoeia of the people's Republic of China (2010 Edition). A comparison of the chemical compositions and bioactive ingredients between natural CS and fermented CS was reported elsewhere. The natural CS contains 29.1% protein, 8.62% fat, 24.2% carbohydrate, 2.85% ash, 8.93% moisture, 18.1% amino acid and 5.4% cordycepin; the fermented CS contains 14.8% protein, 6.63% fat, 39.4% carbohydrate, 2.95% ash, 6.4% moisture, 9.23% amino acid and 1.4% cordycepin. CS capsules were supplied by Hangzhou Zhongmei Huadong Pharmaceutical Co., Ltd., (Hangzhou, China). CS tablets were supplied by Qinghai Everest Aweto Pharmaceutical Co., Ltd., (Qinghai, China). The two formulations of fermented CS are listed in the Pharmacopoeia of the people's Republic of China (2010 Edition). DOX Hydrochloride for injection was obtained from Zhejiang Hisun Pharmaceutical Co., Ltd., (Taizhou, China). Male Sprague-Dawley rats (190 g -2 10 g) were supplied by Shanghai Laboratory Animal Co., Ltd., (Shanghai, China). All animals were maintained on a 12 h light/12 h dark cycle room with a temperature of 22-24°C and humidity of 40% ± 5%. These rats received humane care and had free access to a standard diet and drinking water. Animal experiments were conducted in accordance with the guide for the care and use of laboratory animals published by the U.S. National Institutes of Health (NIH Publication No. 85-23, revised 1996) and approved by the Animal Care and Use Committee of the Shanghai University of Traditional Chinese Medicine. 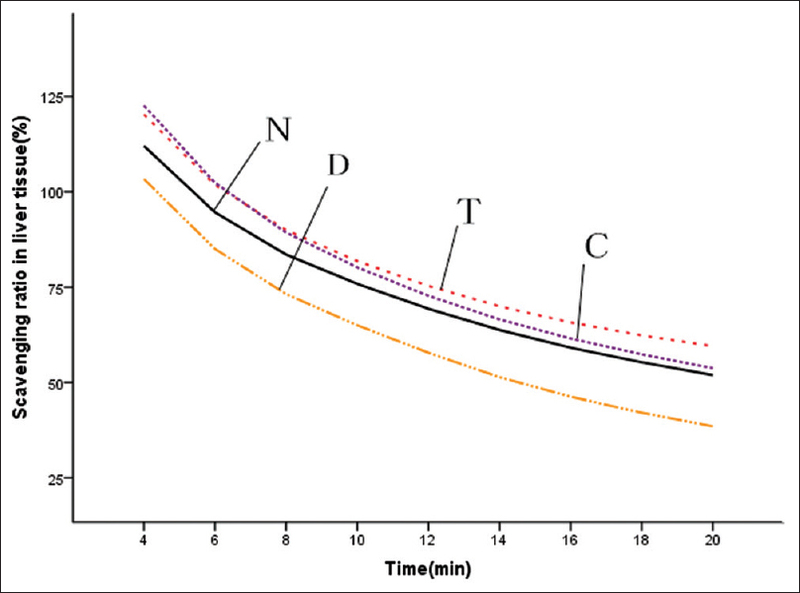 Rats received a tail-intravenous injection of 0.2% DOX (total of 7.5 mg/kg, twice, interval of 1-week) to induce OS. 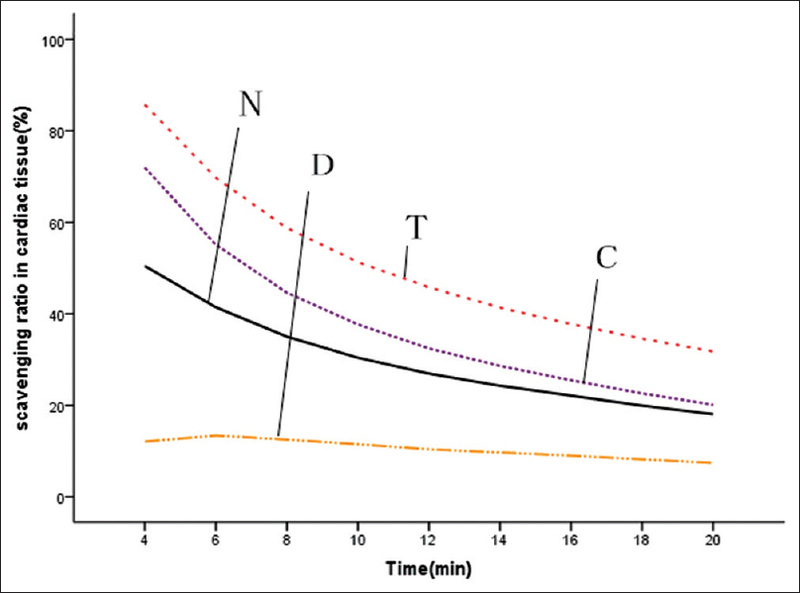 The normal control group consisting of 12 rats received a tail-intravenous injection of 0.9% NaCl (the solvent for DOX, the same volume with DOX) to eliminate the influence of solvent and injection on rats. One week after modeling, OS rats were randomly divided into three groups: DOX control, DOX + CS tablet, and DOX + CS capsule. Rats in the drug treatment groups were administered intragastrically with 1.5 g/kg/day CS for 4 weeks, while rats in the normal control and DOX control groups were administered intragastrically with the same volume drinking water. At the end of the experiment, the rats were sacrificed under anesthesia (urethane, 1 g/kg). Blood samples were collected and centrifuged (4°C, 2325 × g, 10 min) to recover serum, and heart and liver tissues were excised and stored at −80°C. Liver and heart tissues were homogenized with cold 0.9% NaCl and centrifuged (4°C, 1780 × g, 15 min) to recover the supernatants. The supernatants and serum were used for enzyme activity assays. Total SOD (T-SOD), GSH-Px, and CAT activities in the heart, liver, and serum were assayed by the xanthinoxidase method, DTNB colorimetric method, and ammonium molybdate spectrophotometric method using kits (Nanjing Jiancheng Bioengineering Institute, Nanjing, China). Where A 0 is the absorbance of control without the tested samples and A 1 is the absorbance in the presence of the tested sample. Serum creatine kinase (CK), lactate dehydrogenase (LDH), alanine aminotransferase (ALT), and aspartate aminotransferase (AST) activities were analyzed with the Hitachi 7080 biochemical analyzer (Tokyo, Japan). CK, LDH, ALT, and AST kits were obtained from Shino-Test Co., Ltd., (Tokyo, Japan). Serum transforming growth factor-β1 (TGF-β1) and interleukin-8 (IL-8) levels were measured using enzyme-linked immunosorbent assay kits (Shanghai Yu Sen Biotechnology Co., Ltd., Shanghai, China). All values were expressed as mean ± standard deviation and analyzed using SPSS 18.0 software (Statistical Product and Service Solutions, IBM Co., Ltd., New York, America). One-way analysis of variance (ANOVA) was performed for multiple comparisons, followed by Dunnett's test to evaluate the difference between two groups. Rank-sum test was used as an alternate test for variance heterogeneity. When several measurements were taken on the same experimental unit, statistical analysis was evaluated by repeated-measures ANOVA. (P < 0.05) was considered statistically significant. Six weeks after injection of DOX, the content of serum MDA was significantly higher (P < 0.01) and the serum T-SOD activity was significantly lower (P < 0.01). Treatment with CS capsule for 4 weeks significantly reduced the MDA contents in liver and cardiac tissues (P < 0.05), but no significant change occurred in the content of serum MDA [Figure 1]. In addition, CS capsule and CS tablet significantly increased the T-SOD activities in cardiac tissues, but the improvement of T-SOD activities in serum and liver tissues was not evident (P > 0.05) [Figure 2]. Six weeks after injection, DOX significantly reduced the GSH-Px and CAT activities in serum and liver and cardiac tissues (P < 0.05). 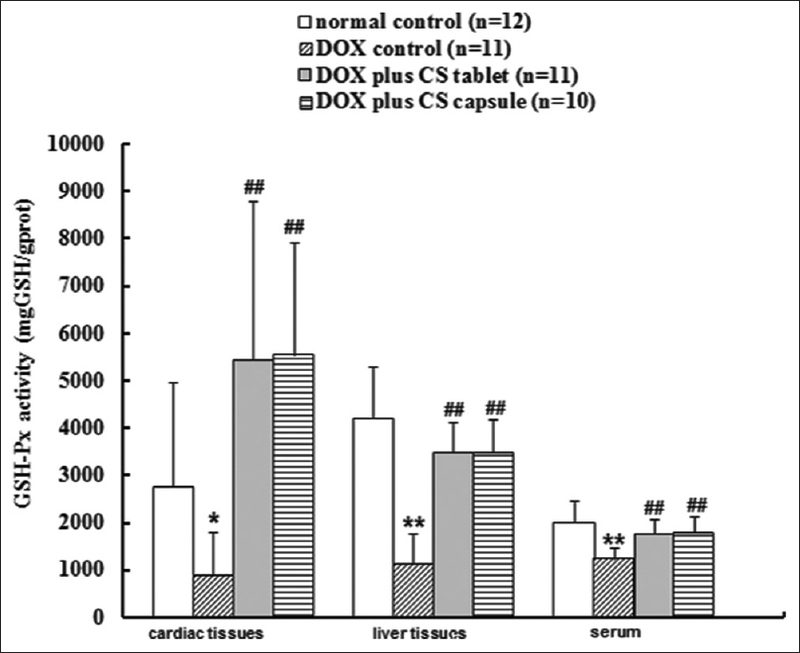 After treatment for 4 weeks, CS capsule and CS tablet significantly increased the CAT activities in cardiac (P < 0.01) and liver tissues (P < 0.05), and the GSH-Px activities of serum and liver and cardiac tissues (P < 0.01) [Figure 3]; CS tablet significantly increased the serum CAT activity (P < 0.05) [Figure 4]. Six weeks after injection, DOX significantly reduced the serum O 2− radical scavenging activity (P < 0.05) [Figure 5]. 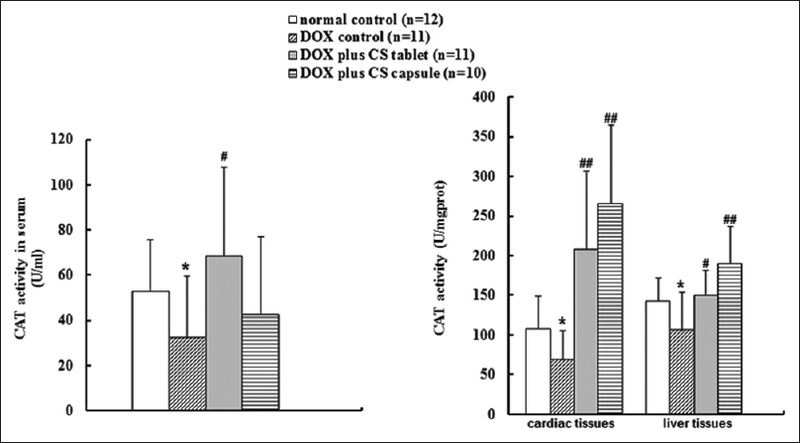 Compared with DOX control group, CS capsule increased the scavenging activity of O 2− in liver tissues (P < 0.05) [Figure 6] and serum (P = 0.05028); CS tablet increased the scavenging activity of O2− in cardiac tissues (P < 0.05) [Figure 7] and trended to increase the scavenging activity of O2− in liver tissues (P = 0.07844). Six weeks after injection of DOX, no significant change occurred in the serum CK, LDH, ALT, and AST activities, suggesting that the influences on liver and myocardial enzyme systems induced by DOX for 6 weeks were not evident in this experiment. After treatment for 4 weeks, CS tablets significantly decreased the CK activity (P < 0.05); CS capsule and CS tablet significantly decreased the LDH activity (P < 0.05); and no significant change occurred in the ALT and activities [Figure 8]. Six weeks after injection of DOX, no significant change occurred in the levels of TGF-β1 and IL-8, suggesting that the effect of DOX on inflammation was not evident in this experiment. Treatment with CS tablet for 4 weeks significantly decreased the TGF-β1 and IL-8 concentrations (P < 0.05) [Figure 9]. Doxorubicin is an anthracycline anticancer antibiotic which is extensively used as a potent and broad spectrum anti-cancer agent. The anticancer activity of DOX comes from its inhibition effect in the process of DNA replication,  it can interact with DNA by reducing of macromolecular biosynthesis. It is used to treat several solid tumors and hematological malignancies such as lymphomas, breast cancer and leukemia,  but the clinical use of DOX is limited by its serious adverse effect including cardiotoxicity and hepatotoxicity. DOX has a high affinity of binding to phospholipid in the inner mitochondrial membrane. The heart and liver are susceptible to DOX injury, as they contain more mitochondria. Mechanism of DOX damage in the body is associated with the free radicals it produces,  which lead to OS. Oxidative stress is the basis of many diseases and pathological processes. DOX-induced OS can lead to the increase in OS products and the decrease in the activities of antioxidant enzymes and thus cause the damage of membrane lipids and other cell components, and eventually give rise to multiple organ injury. 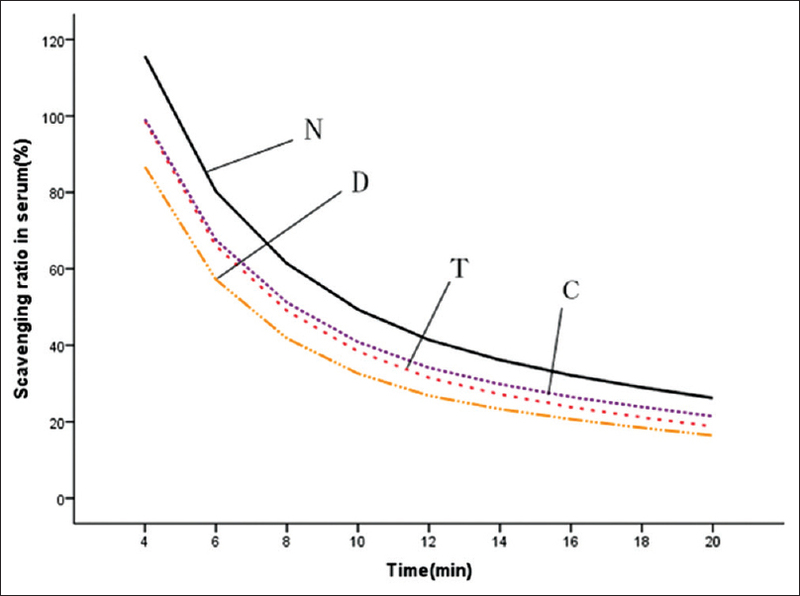 For this reason, we chose to measure the relevant biomarkers in serum and liver and cardiac tissues of rat to evaluate whether fermented CS inhibits the DOX-induced OS response, and then assess the difference of its antioxidant capacity in liver and heart. The present study is designed to provide an experimental basis for the application of fermented CS to treat OS injury in heart and liver. As a final product of lipid peroxidation, MDA can generate covalent adducts that probably lead to protein damage. It is a relevant biomarker for assessing the degree of oxidative damage. Thus, we can evaluate the level of OS by measuring the MDA content and reveal the damage degree of the body. , T-SOD, CAT, and GSH-Px belong to the antioxidant enzyme system of the body and are able to remove free radicals and protect cells and tissues. Among them, SOD is the essential enzyme in removing free radicals, it can catalyze the disproportionation reaction and thus remove O2− , constituting a critical defense mechanism of cells against the harmful effects of ROS. , CAT and GSH-Px are two vital enzymes that inhibit oxidative damage, they play important roles in anti-oxidant enzyme system. ,, The main role of CAT is to catalyze the conversion of H2 O2 to H2 O and O2 , and the main biological function of GSH-Px is to turn lipid peroxide into the corresponding alcohol and reduce free H2 O2 into H2 O, thus protecting the body from oxidative damage. Therefore, the activities of T-SOD, CAT, and GSH-Px can reflect the capacity of the body in removing free radicals. Some studies, , show that O2− clearance is multifactorial, and the related compounds include endogenous SOD, vitamin C, vitamin E, and exogenous active ingredients. In the present study, we adopted pyrogallol autoxidation method,  to measure superoxide radical scavenging ability of the biological samples of experimental rats to reveal more comprehensively the effect of drugs on improving the body's ability in clearing O2− free radicals. Six weeks after injection of DOX, an evident decrease in both the superoxide radical scavenging ability and the activities of T-SOD, GSH-Px, and CAT in the serum of DOX control group rats and an obvious increase in the amount of MDA were observed. Those results indicate that DOX significantly reduces the activities of the anti-oxidant enzymes of rats and significantly increases the lipid peroxidation products. However, after rats were fed with fermented CS by oral gavage for 4 weeks, it significantly improved the activities of GSH-Px and CAT. In addition, fermented CS had a certain effect in improving the activity of SOD and raising the O2− clearance rate as well, and some effect in reducing the amount of MDA. The results show that fermented CS has a significant effect in inhibiting DOX-induced OS, especially in increasing the activities of the anti-oxidant enzymes. Doxorubicin causes damage to the body and especially leads to heart diseases,  and liver damage,  by inducing OS. LDH and CK are both cardiac enzymes. In the case of myocardial injury or necrosis, these enzymes will be released into blood, and then their activities in serum will be increased. Based on this reason, testing the activities of these enzymes in serum is essential in diagnosing myocardial injury. ALT and AST mainly exist in the liver and other tissues. In the case of liver damage or cell necrosis, the release of ALT and AST from liver cells will induce the increase of their activities in serum. Therefore, liver injury can be assessed by detecting the activities of ALT and AST in serum. Six weeks after injection, DOX did not significantly influence the serum activities of CK, LDH, ALT, and AST. This result indicates that DOX significantly increases the level of OS in the heart and liver 6 weeks after injection in this experiment but the damage of hepatocytes and cardiomyocytes may be not so obvious. However, treatment with fermented CS for 4 weeks significantly reduced the activity of LDH and CK but did not influence the activities of AST and ALT. This result indicates that fermented CS may potentially have protective effect against myocardial tissue damage. Oxidative stress is closely related to inflammation. The increase of ROS can activate IL-8 and other cytokines, , which will cause a certain degree of neutrophil infiltration, intensify inflammatory response, and lead to cell damage. As a major inflammatory cytokine, IL-8 is an effective diagnostic biomarker for inflammatory diseases. The mechanism of IL-8 in the immune system is complex, including chemotactic effects on target cells (neutrophils and other granulocytes) and pro-inflammatory effects by enhancing degranulation and activation of basophils, neutrophils and macrophages. When inflammatory reaction occurs, IL-8 concentration significantly increases in inflammatory tissues, serum, and body fluids. ROS are also associated with the generation of TGF-β1 and at the same time takes part in a series of TGF-β1-induced pathological response. TGF-β1, as one kind of immunosuppressive factors, participates in the immune responses mainly by suppressing natural killer cells and macrophages, inhibiting the production of regulatory T cells and the differentiation of helper T cells, and suppressing the proliferation of B and T cells. TGF-β1 is also a key fibrosis factor. Under pathological conditions, such as inflammation, increasing TGF-β1 will lead to extracellular matrix overproduction and thus cause liver fibrosis and cardiac fibrosis. , Six weeks after injection of DOX, the level of IL-8 slightly increased, but no significant difference was observed between normal control and DOX control rats. After treatment for 4 weeks, fermented CS showed a certain effect in reducing IL-8 and TGF-β1, indicating that it may play a potential role in protecting the body against inflammation. Mitochondrial respiratory chain complexes produce adenosine triphosphate through electron transfer. As the main source of ROS in the body, mitochondria are abundant in hepatocytes and cardiomyocytes. Thus, heart and liver are easily attacked by ROS. Closely associated with cardiovascular diseases, OS can lead to atherosclerosis, myocardial hypertrophy, and cardiac myocyte apoptosis and other diseases. OS can also be a precipitating factor in certain liver diseases, closely related to liver cancer, liver fibrosis, and other liver injuries. , Therefore, by comparing the effect of fermented CS on inhibiting the OS in heart and liver, we can make a clearer assessment on its selective role on inhibiting OS in different organs. By comparing the antioxidant indicators in serum and liver and cardiac tissues, fermented CS showed a significant effect in increasing the activity of SOD in cardiac tissues, but had insignificant effect in serum and liver tissues. It also had significant effects in increasing the activities of CAT and GSH-Px in serum and liver and cardiac tissues. The rates of increase in the activities of CAT and GSH-Px in liver and heart were obviously higher than those in the serum, and most notably in cardiac tissue. In addition, in the groups of fermented CS, no significant decrease was observed in the MDA content in serum. The significant decrease in MDA occurred in heart and liver tissues, with a higher rate of decrease in heart tissues. Therefore, fermented CS has more obvious effect of anti-OS in heart and liver, especially in heart. Fermented CS can ameliorate the OS in DOX treated rats. It is mainly manifested in the obvious improvement of the antioxidant enzyme system. Its protective effects are more obviously in heart and liver, especially in heart. Therefore, fermented CS can be recommended for a promising adjuvant of DOX in clinical application. It can also be a candidate used for the prevention against various cardiac diseases induced by OS. The additional studies are necessary to evaluate the efficacy of fermented CS in treating DOX-induced cardiotoxicity and hepatotoxicity. This work was supported by Shanghai Municipal Education Commission and the Shanghai University of Traditional Chinese Medicine budget project (2014YSN07). Inoue M, Sato EF, Nishikawa M, Park AM, Kira Y, Imada I, et al. Mitochondrial generation of reactive oxygen species and its role in aerobic life. Curr Med Chem 2003;10:2495-505. Soffler C. Oxidative stress. Vet Clin North Am Equine Pract 2007;27:135-57. Forgione MA, Cap A, Liao R, Moldovan NI, Eberhardt RT, Lim CC, et al. Heterozygous cellular glutathione peroxidase deficiency in the mouse: Abnormalities in vascular and cardiac function and structure. Circulation 2002;106:1154-8. Bosch-Morell F, Romá J, Puertas FJ, Marín N, Díaz-Llopis M, Romero FJ. Efficacy of the antioxidant ebselen in experimental uveitis. Free Radic Biol Med 1999;27:388-91. Babizhayev MA. Failure to withstand oxidative stress induced by phospholipid hydroperoxides as a possible cause of the lens opacities in systemic diseases and ageing. Biochim Biophys Acta 1996;1315:87-99. Xin WJ, Zhao BL, Li XJ, Hou JW. Scavenging effects of Chinese herbs and natural health products on active oxygen radicals. Res Chem Intermediates 1990;14:171-83. Finley JW, Kong AN, Hintze KJ, Jeffery EH, Ji LL, Lei XG. Antioxidants in foods: State of the science important to the food industry. J Agric Food Chem 2011;59:6837-46.
de Oliveira e Silva AM, Vidal-Novoa A, Batista-González AE, Pinto JR, Portari Mancini DA, Reina-Urquijo W, et al. In vivo and in vitro antioxidant activity and hepatoprotective properties of polyphenols from Halimeda opuntia (Linnaeus) lamouroux. Redox Rep 2012;17:47-53. Takemura G, Fujiwara H. Doxorubicin-induced cardiomyopathy from the cardiotoxic mechanisms to management. Prog Cardiovasc Dis 2007;49:330-52. Li SP, Li P, Lai CM, Gong YX, Kan KK, Dong TT, et al. Simultaneous determination of ergosterol, nucleosides and their bases from natural and cultured Cordyceps by pressurised liquid extraction and high-performance liquid chromatography. J Chromatogr A 2004;1036:239-43. Zhu JS, Halpern GM, Jones K. The scientific rediscovery of an ancient Chinese herbal medicine: Cordyceps sinensis: Part I. J Altern Complement Med 1998;4:289-303. Zhu JS, Halpern GM, Jones K. The scientific rediscovery of a precious ancient Chinese herbal regimen: Cordyceps sinensis: Part II. J Altern Complement Med 1998;4:429-57. Li SP, Li P, Dong TT, Tsim KW. Anti-oxidation activity of different types of natural Cordyceps sinensis and cultured Cordyceps mycelia. Phytomedicine 2001;8:207-12. Lo HC, Hsu TH, Tu ST, Lin KC. Anti-hyperglycemic activity of natural and fermented Cordyceps sinensis in rats with diabetes induced by nicotinamide and streptozotocin. Am J Chin Med 2006;34:819-32. Yamaguchi Y, Kagota S, Nakamura K, Shinozuka K, Kunitomo M. Antioxidant activity of the extracts from fruiting bodies of cultured Cordyceps sinensis. Phytother Res 2000;14:647-9. Zhang J, Yu Y, Zhang Z, Ding Y, Dai X, Li Y. Effect of polysaccharide from cultured Cordyceps sinensis on immune function and anti-oxidation activity of mice exposed to 60Co. Int Immunopharmacol 2011;11:2251-7. Hsu TH, Shiao LH, Hsieh C, Chang DM. A comparison of the chemical composition and bio-active ingredients of the Chinese medicinal mushroom DongChongXiaCao, its counterfeit and mimic, and fermented mycelium of Cordyceps sinensis. Food Chem 2002;78:463-9. Tacar O, Sriamornsak P, Dass CR. Doxorubicin: An update on anticancer molecular action, toxicity and novel drug delivery systems. J Pharm Pharmacol 2013;65:157-70. Fornari FA, Randolph JK, Yalowich JC, Ritke MK, Gewirtz DA. Interference by doxorubicin with DNA unwinding in MCF-7 breast tumor cells. Mol Pharmacol 1994;45:649-56. Octavia Y, Tocchetti CG, Gabrielson KL, Janssens S, Crijns HJ, Moens AL. Doxorubicin-induced cardiomyopathy: From molecular mechanisms to therapeutic strategies. J Mol Cell Cardiol 2012;52:1213-25. Parker MA, King V, Howard KP. Nuclear magnetic resonance study of doxorubicin binding to cardiolipin containing magnetically oriented phospholipid bilayers. Biochim Biophys Acta 2001;1514:206-16. Lebrecht D, Setzer B, Ketelsen UP, Haberstroh J, Walker UA. Time-dependent and tissue-specific accumulation of mtDNA and respiratory chain defects in chronic doxorubicin cardiomyopathy. Circulation 2003;108:2423-9. Traverso N, Menini S, Maineri EP, Patriarca S, Odetti P, Cottalasso D, et al. Malondialdehyde, a lipoperoxidation-derived aldehyde, can bring about secondary oxidative damage to proteins. J Gerontol A Biol Sci Med Sci 2004;59:B890-5. Gutteridge JM. Lipid peroxidation and antioxidants as biomarkers of tissue damage. Clin Chem 1995;41(12 Pt 2):1819-28. Pirinccioglu AG, Gökalp D, Pirinccioglu M, Kizil G, Kizil M. Malondialdehyde (MDA) and protein carbonyl (PCO) levels as biomarkers of oxidative stress in subjects with familial hypercholesterolemia. Clin Biochem 2010;43:1220-4. McCord JM, Fridovich I. Superoxide dismutase. An enzymic function for erythrocuprein (hemocuprein). J Biol Chem 1969;244:6049-55. Anwar S, Khan MA, Sadaf A, Younus H. A structural study on the protection of glycation of superoxide dismutase by thymoquinone. Int J Biol Macromol 2014;69:476-81. Takahashi K, Avissar N, Whitin J, Cohen H. Purification and characterization of human plasma glutathione peroxidase: A selenoglycoprotein distinct from the known cellular enzyme. Arch Biochem Biophys 1987;256:677-86. Chu FF, Doroshow JH, Esworthy RS. Expression, characterization, and tissue distribution of a new cellular selenium-dependent glutathione peroxidase, GSHPx-GI. J Biol Chem 1993;268:2571-6. Jones JT, Reavy B, Smant G, Prior AE. Glutathione peroxidases of the potato cyst nematode Globodera rostochiensis. Gene 2004;324:47-54. Janisch KM, Milde J, Schempp H, Elstner EF. Vitamin C, vitamin E and flavonoids. Dev Ophthalmol 2005;38:59-69. Xu L, Li HM, Huang YB, Wang H, Nie GJ, Zhang XZ. A study on anti-oxidative activity of soybean peptides with linoleic acid peroxidation systems. Chem Res Chin Univ 2006;22:205-8. Wallace KB. Doxorubicin-induced cardiac mitochondrionopathy. Pharmacol Toxicol 2003;93:105-15. El-Moselhy MA, El-Sheikh AA. 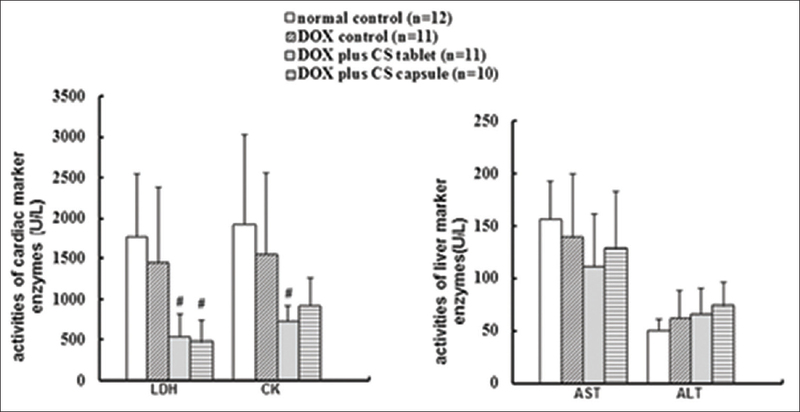 Protective mechanisms of atorvastatin against doxorubicin-induced hepato-renal toxicity. Biomed Pharmacother 2014;68:101-10. DeForge LE, Preston AM, Takeuchi E, Kenney J, Boxer LA, Remick DG. Regulation of interleukin 8 gene expression by oxidant stress. J Biol Chem 1993;268:25568-76. Biagioli MC, Kaul P, Singh I, Turner RB. The role of oxidative stress in rhinovirus induced elaboration of IL-8 by respiratory epithelial cells. Free Radic Biol Med 1999;26:454-62. Gill EA, Imaizumi T, Carveth H, Topham MK, Tarbet EB, McIntyre TM, et al. Bacterial lipopolysaccharide induces endothelial cells to synthesize a degranulating factor for neutrophils. FASEB J 1998;12:673-84. Stuart MJ, Baune BT. Chemokines and chemokine receptors in mood disorders, schizophrenia, and cognitive impairment: A systematic review of biomarker studies. Neurosci Biobehav Rev 2014;42:93-115. Herrera B, Alvarez AM, Sánchez A, Fernández M, Roncero C, Benito M, et al. Reactive oxygen species (ROS) mediates the mitochondrial-dependent apoptosis induced by transforming growth factor (beta) in fetal hepatocytes. FASEB J 2001;15:741-51. Yoshimura A, Wakabayashi Y, Mori T. Cellular and molecular basis for the regulation of inflammation by TGF-beta. J Biochem 2010;147:781-92. Stärkel P, Sempoux C, Leclercq I, Herin M, Deby C, Desager JP, et al. Oxidative stress, KLF6 and transforming growth factor-beta up-regulation differentiate non-alcoholic steatohepatitis progressing to fibrosis from uncomplicated steatosis in rats. J Hepatol 2003;39:538-46. Lijnen PJ, Petrov VV, Fagard RH. Induction of cardiac fibrosis by transforming growth factor-beta(1). Mol Genet Metab 2000;71:418-35. Kwon SH, Pimentel DR, Remondino A, Sawyer DB, Colucci WS. H( 2 )O( 2 ) regulates cardiac myocyte phenotype via concentration-dependent activation of distinct kinase pathways. J Mol Cell Cardiol 2003;35:615-21. Irshad M, Chaudhuri PS, Joshi YK. Superoxide dismutase and total anti-oxidant levels in various forms of liver diseases. Hepatol Res 2002;23:178-184. Yesilova Z, Yaman H, Oktenli C, Ozcan A, Uygun A, Cakir E, et al. Systemic markers of lipid peroxidation and antioxidants in patients with nonalcoholic fatty liver disease. Am J Gastroenterol 2005;100:850-5.